Ever wondered how Google Street View is put together? TechRadar caught up with Ed Parsons, Geospatial Technologist at Google UK to find out. 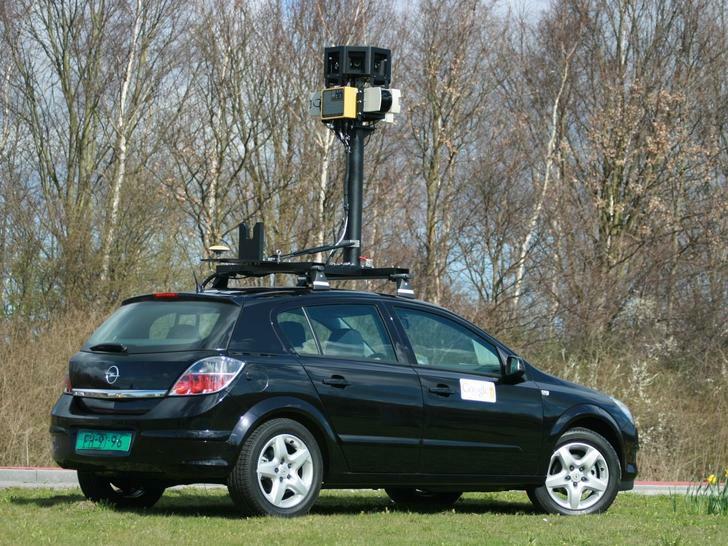 Parsons represents Google Maps, Street View, and Google's mobile apps. While Parsons refused to reveal exactly how many cars and employees are working on Street View in the UK, he did say that the number of cars was "in the tens". The drivers are contractors rather than Google employees, he reveals, while the cars are owned by Google. "We had to make some modifications to the cars themselves for them to work, so we buy the cars," explains Parsons. Those cars are all Vauxhall/Opel Astras. "We chose those because we can interface quite easily with the on-board information system that the car has – it's something that we need to be able to plug into." So how does a driver work out the most efficient route around a city – surely a powerful Google app calculates the best route and uploads it to the driver's sat nav? The truth is a little more low tech. "A lot of it is put into the hands of the drivers because they tend to know the local areas," says Parsons. "We say 'we need to cover every street that it's possible for you to drive down' – that's a major element of what we do. We can only really drive down public streets so the drivers pretty much go off and drive their own local neighbourhood." It doesn't always go perfectly, though: "Sometimes there may be roads being dug up, or there's a dustbin truck in the middle of the street, or they may miss a road – and we may have to come back and do that at a later date." That explains the occasional gaps in Street View. "If you look at Street View in the UK as it is today there are odd streets that are missing for, it seems, no apparent reason," says Parsons. "Those are things that we'll need go back and fill in." Unsurprisingly for the UK, the weather is another constraint. Cloudy weather works well for lighting, Parsons tells us, but if it's raining the cars don't go out. Once the car is out on the road, the system works without any extra assistance from the driver. The system is completely automated, explains Parsons. "They basically boot the system in the morning, it takes a few minutes to work out where the car is and get everything stabilised, and then the driver just drives. And they just concentrate on driving – they don't have to worry about the system, it's all completely automated." As part of this automated process, the cameras affixed to the mast on the roof of the car take "pretty much the standard aspect ratio images" which are stitched together when the data is downloaded. Parsons explains how the system works: "As well as the cameras on the cars, there's very accurate GPS, so every picture is geocoded and because there's also an inertial measurement unit on the car, we know which direction it's pointing and which direction the cameras are pointing. So the pictures are geocoded and recorded onto a hard disk in the vehicle and at the end of the driving session we take the hard disk out and start processing the data." As you'd expect from Google, this processing is done in the cloud. "There are a couple of data centres in and around Europe that we get the hard disks to and then they're uploaded onto a network. It would be difficult to say where exactly any image was processed – it tends to happen around the organisation we have globally," says Parsons. When the Google Street View car arrived in Broughton, Buckinghamshire, a group of angry residents blocked it from continuing with its work. Broughton, incidentally, already has a somewhat dated picture gallery on its own village website. But most people don't mind the Google cars - or even notice them - Parsons tells us. "I've driven on a couple of occasions with the drivers and I guess somewhere in the order of about 10% of people actually notice as you're driving along. Most people in their day-to-day lives are just getting on with stuff and not really watching the traffic." But you can occasionally see people who do notice in the shots on Street View, says Parsons. "If you look at pictures that were taken behind the car, occasionally you see people turning around and pointing." Surely some well organised communities have turned out dressed in chicken suits resulting in photos that have to be deleted from Street View? "No," laughs Parsons, "we never really say 'OK, we're going to be driving on this particular street on any day' - and in many cases we actually don't know because it's down to the drivers and what they're doing on any particular day - so people don't get a forewarning that the car is going to be driving down any particular street. Which is probably the best way to do it!"